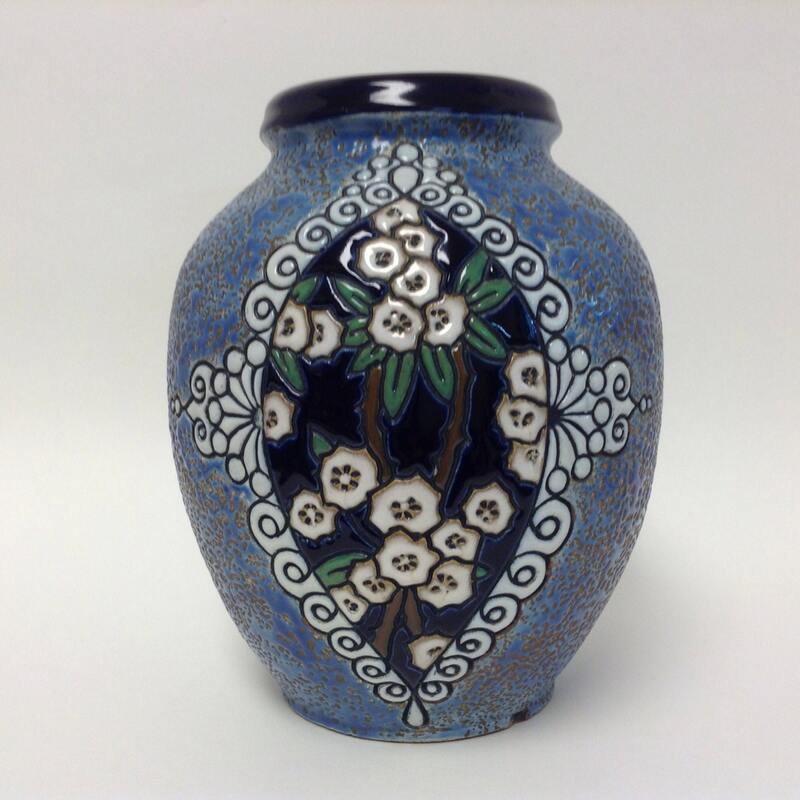 Striking color and beautiful design are present in this stylish Art Nouveau Amphora vase. The vase is decorated with a low relief, moulded medallion of floral blooms, stems and leaves hand-etched in black and filled in with vibrant, glossy colors - cream, white, cobalt, green and brown. The remainder of the vase is textured - a rough-cast blue and golden brown mottled glaze finish. The piece is in very good condition with no cracks or repairs. There is crazing visible in the interior of the vase and on the bottom. There is a chip to the base edge on the medallion or front side of the vase (see photos one and four). Two minute flea bites are present on the bottom edge of the cobalt rim (see photo five, center, in the highlighted area). The ovoid-shaped piece measures 9 1/2" tall by 7 5/8" in diameter at the widest part of the body. The top rim measures 4 1/2" in diameter (outer) and 3 9/16" in diameter (inner). The base diameter is 4 7/16". The additional letters/numbers may possibly be an artist's mark or signature.